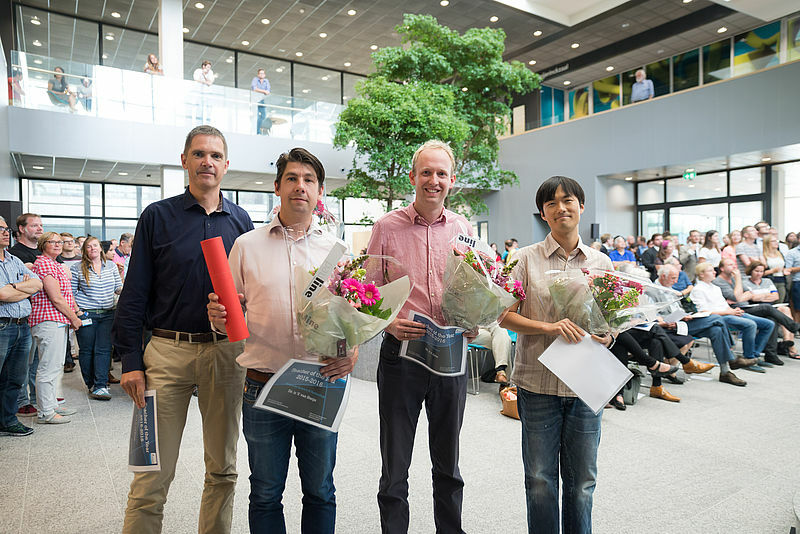 During the Opening of the Academic Year at the Applied Science Faculty in Delft, dean Lucas van Vliet has awarded Sander Otte (QN) and Hyun Youk (BN) with the Teacher of the Year Award. The study associations of the Faculty of Applied Sciences organised preelections for the award. Sander Otte received the prize for his teaching in Applied Physics, Hyun Youk for the effort that he put into the teaching of Nanobiology to his students. The winners with their awards, from left to right: Jack Pronk (Life Science &Technology), Volkert van Steijn (Molecular Science & Technology, also awarded with the Best Teacher award), Sander Otte (Applied Physics) and Hyun Youk (Nanobiology).